Join the 24,800+ others that receive AMAZING recipes in their inbox each day! It's FREE! 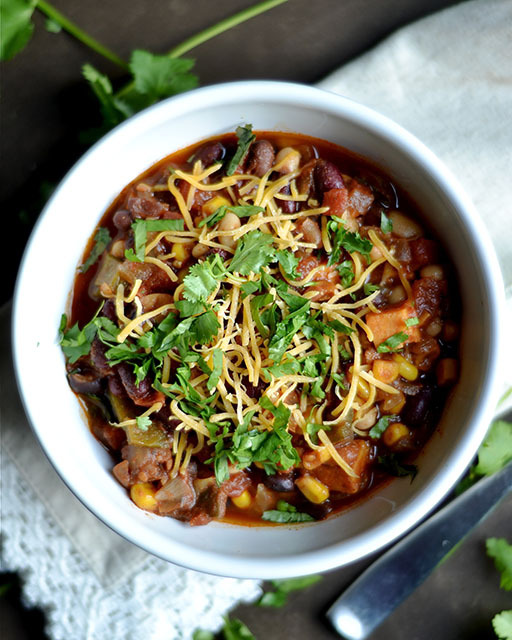 This EASY Instant Pot Vegetarian Chili is made in less than 20 minutes from start to finish!! All the same flavors of hearty chili in a fraction of the time. I have never made chili in my life that took less than 20 minutes. I mean, who would ever think that was possible? Chili is supposed to cook for hours and the flavors are supposed to meld together and get better over time. Right? Not if you have an Instant Pot! I was absolutely floored with delight when my vegetarian chili came out just as yummy in my Instant Pot as it did with simmering several hours on the stovetop. Did I mention less than 20 minutes? You can honestly throw this dish together without even doing much planning. The meal prep is super simple too. 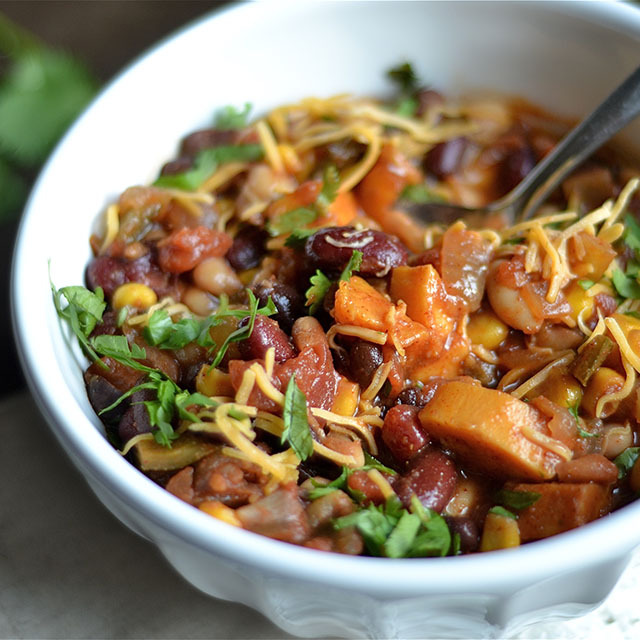 I love this chili as a healthy Meatless Monday recipe. It contains 3 different types of beans, several yummy spices, vegetables such as poblano & jalapeño peppers, and sweet potatoes. You can easily substitute bell pepper for poblanos, or add in some chipotle peppers and adobo for more kick. The beer is a must! Top with your favorite toppings, or even load up some chips for some vegetarian nachos. I especially love cilantro, avocado, and shredded cheddar. My kids love this recipe too. I give them the option of enjoying a bowl or wrapping in a tortilla as a taco. With football in full swing, and entertainment season upon us, this dish is a no brainer to serve to a crowd. Everyone will love the flavors, and the recipe comes together so easily. Having a baked potato bar with chili as the main addition is also a fun idea for a party! So many options with this versatile and easy recipe. Select the saute function on your instant pot and let it heat up for a minute or two. Add olive oil to coat pot. Add onion, garlic, and both peppers. Stir and saute for 3 minutes, or until veggies are softened. Toss in all the spices to include the salt, and mix well to coat the veggies. Saute for another minute. Add all the beans, tomatoes with juice, sweet potatoes, beer (or water), and corn. Secure the lid. Select manual and cook on high pressure for 4 minutes. Once cooking is complete, use a quick release. Remove the lid and stir. For thicker chili, saute on high for an additional 3-5 minutes. Season with more salt if needed and serve immediately with your favorite toppings.